Luz Diaz has a thing for excitement. A New Yorker since 2012, she works as a Field Audio Engineer for NBC News— a high-stress job that puts her “wherever craziness is happening” on a daily basis. Her best assignment yet? The 2014 Winter Olympics in Sochi. This never-a-dull-moment attitude extends into Luz’s favorite pastimes—rock climbing and skydiving. Two years ago, however, it looked like the excitement might come to a grinding halt when Luz suffered a climbing-related impingement to her right shoulder. Being sidelined was not in the playbook for Luz, who experienced pain every time she lifted up her arm. SPEAR therapist Joe Costello, DPT, identified a rotator cuff weakness, then worked with Luz on shoulder mechanics and on strengthening the scapular and rotator cuff muscles. With her usual determination, Luz took on the challenge of healing her shoulder, embarking on a routine of shoulder and back exercises and stability work—whatever it took to get her back to her active life. Once she was better, Luz was still hesitant to go back to climbing, which she’d been doing since college, sometimes competitively. This would’ve slowed many of us down, but not Luz. Instead, she took up skydiving. 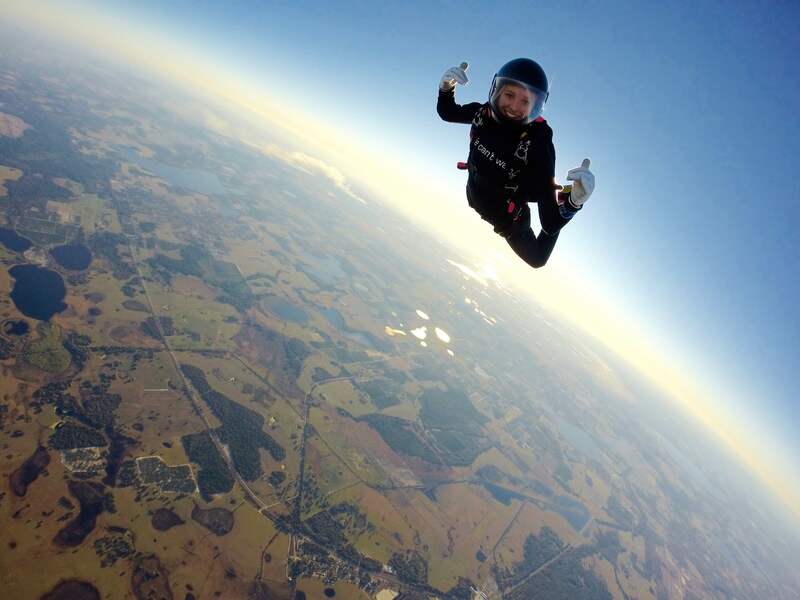 Once a bucket list item for Luz, skydiving took on a new urgency. “I felt if you had the means to do something right now, you should do it now.” After her first dive, she was instantly hooked. Then just after she started skydiving, she developed a much more severe impingement, this time in her left shoulder. Again, Luz rose to the challenge of healing. The day of her injury, she saw Joe Costello, Physical Therapist at SPEAR’S 44th Street location and now Clinical Director at SPEAR’S 57th Street location. Joe loosened her up by mobilizing her shoulder joint, since she couldn’t move it herself. That enabled Luz to raise her arm again on her own. “I felt the most dramatic improvement on my very first day of physical therapy,” Luz explains. “Joe moved my shoulder for me, and it got rid of most of the inflammation and most of the pain.” It was mere weeks before she was back at skydiving. Last summer she suffered another injury, this time to her hand. After a bad landing when skydiving, her hand had become comfortable in a closed fist resting position, and she was having a hard time opening it up. She refocused on her treatment once again. Certified Hand Therapist Phaeleau Cunneen, PT, CHT made her a hand splint which “made a huge difference,” and stretched her hand to regain full movement. It’s safe to say the therapists at SPEAR brought adventure-seeking Luz back to life. Today, she is back to climbing, at The Cliffs at LIC, in Long Island City, and skydiving most weekends at Skydive the Ranch in Gardiner, NY. “Without SPEAR, I wouldn’t be able to rock climb or skydive—the two biggest parts of my life,” says Luz. First and foremost I consider myself a skydiver. I don’t know that I would be able to do that if they hadn’t fixed up my shoulder. Through her hard work and perseverance she is fixed up, and back to enjoying the high-level, high-intensity activities she loves.